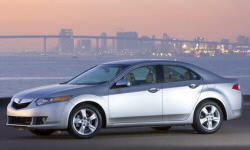 Why the 2009 Acura TSX? Ease of use. There are at leaset a dozen means of playing audio in the car and NAV is sooo intuitive, easy and user friendly. This is my first Acura. However, the brand has a good reputition of reliability. Yet to be seen and hope it all true. Even just the base package comes almost fully loaded - except the premium audio and NAV. Buy the way, the technology package (audio, nav) is so worth it! Besides tech pack, all the features are standard while with other cars, you pay a fortune. Its and Acura. Its a Honda from a reliability standpoint. Yet, its an Acura (though its almost a Honda in other countries). Better milage than my VW Golf 1.8! Golf is a smaller car, less powerful (great ride though!). Fuel economy with the TSX almost certainly better...given the highway miles I put on. Why Not the 2009 Acura TSX? Dislike may not be the right word. But, it has a super sporty feel...being a sedan. This is great at times...but certain times, you prefer a smoother ride than feeling the road as much. There could have been a bit more rear leg space - althoug, the seats are pretty comfortable. Insurance is pretty high - may compare to other newer cars. Though its a Acura (or Honda), depreciation is much worse than what the car compares to - BMW 3 or Audi etc.